The TaxPayers’ Alliance has released the first audit of environmental taxation in the UK alongside a new YouGov poll of more than 2,000 adults commissioned into public attitudes towards green taxes. The report applies the conclusions of the most prominent experts in the field of climate change research (from the International Panel on Climate Change to academics such as William Nordhaus, “father of climate change economics”, and Sir Nicholas Stern), and compares these studies’ recommendations of the price the UK should be prepared to pay to offset the cost of the UK’s carbon footprint with the actual level of green taxation. Such a comparison is the only way of knowing whether environmental taxes address root problems or whether they are merely revenue-raising measures. 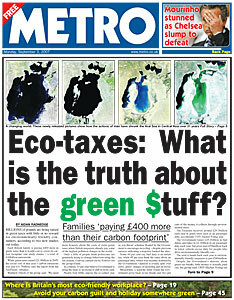 Covering the main “pollution taxes” of fuel duty; vehicle excise duty (road tax); the Climate Change Levy; Air Passenger Duty; the Landfill Tax and the EU Emissions Trading Scheme, the report investigates each of the green taxes and charges in turn, and reveals that each one has serious flaws. In many cases, individual green taxes and charges are failing to meet their objectives, are set at a level in excess of that needed to meet the social cost of CO2 emissions, and are causing serious harm to areas of the country and industries least able to cope. Taking an average of the most widely quoted official and academic estimates of the social cost of CO2 emissions shows that green taxes in the UK are already well in excess of the level they need to be to meet these social costs. The social cost of Britain’s entire output of CO2 was £11.7 billion in 2005 but in the same year, the total net burden of green taxes and charges was £21.9 billion. This means that green taxes and charges are already £10.2 billion in excess of the level they need to be to meet the social cost of Britain’s CO2 emissions. This excess is equivalent to over £400 for each household in Britain. Green taxes are therefore already too high if they really are a means of internalising environmental externalities rather than simply revenue-raising measures. A vast majority (77 per cent) disapprove of local councils placing extra charges for bin collection on top of council tax to encourage recycling, including two thirds (65 per cent) who would “strongly disapprove”. 60 per cent think that Fuel Duty is an unfair tax, compared with just 17 per cent who think it is fair. 45 per cent believe that Air Passenger Duty is unfair, compared with 23 per cent who think it is fair. Concern for the environment will not lead people to change their behaviour unless there are significant tax increases – in the realm that most politicians would be unwilling to advocate. When asked how much extra air passenger duty would have to cost before they chose not to fly, more than two thirds (71 per cent) would only stop flying if Air Passenger Duty was trebled from its current rate. If politicians only doubled it, 81 per cent of people would still choose to fly. 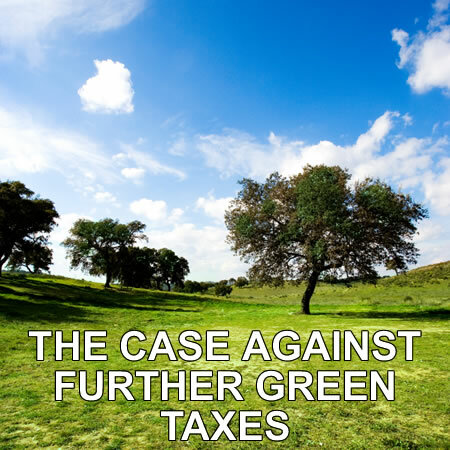 As a result of this scepticism, there was a very strong view that any new green taxes should not add to the already high tax burden but should be met with reductions in other taxes. A majority (61 per cent) thought that if extra ‘green’ taxes were raised, “the extra funds should be used to reduce other taxes”. There is no majority support for moving towards additional green taxes. When asked whether, “Generally speaking do you approve or disapprove of additional ‘green’ taxes on motoring and air travel?”, 46 per cent disapproved while 45 per cent approved and one in four people “strongly disapproved” against less than one in ten who “strongly approved”. The report and poll has already been featured as the main story on the front-page of yesterday's Metro, the free-sheet with a daily readership of up to 2 million people. The story was also reported by the Today Programme, and in the Daily Telegraph, BBC News Online, The Sun, Scotsman, Evening Standard and the Financial Times. Matthew Elliott, the TPA's Chief Executive was also interviewed about the cost of green taxes by Newsnight, in the context of the announcement of the Conservative Party's commitment to match Labour spending plans. You can watch it here (25 mins in). "I've had an incredibly enjoyable time at one of the highest-profile and most energetic campaigns in Britain. We have achieved an enormous amount and are now a permanent presence in the UK political debate. Thank you to everyone who has helped the TPA grow and increase its profile over the last year, and special thanks to all the ordinary TPA supporters I have met and spoken to. It has been a real pleasure working daily for a cause I believe in and I wish the campaign all the best for the future." Anyone who is interested in joining the TPA's Campaign Team, in a full-time, salaried role, should contact Matthew at matthew.elliott@taxpayersalliance.com. We are also keen to hear from anyone who would like to join us for any period up to a month between now and Christmas as an intern. Please email Matthew for further details.